Here we tackle the subject for those who, presently, do not need to be perspective experts. A thorough knowledge of the subject is useful but there is time for that later on, when and if one feels the need of it. At the beginning it is better not to be too perspective-conscious because other things are of greater importance. Professional painters often violate perspective facts intentionally in order to give free reign to impulsive expression and, in many cases, to achieve something through design without the restriction of realistic appearance. No doubt a very talented artist is sometimes merely careless about some details of his work, as might have been the case with Thomas Rowlandson who surely knew how wheels look in such a position as seen in his drawing of the coach [Figure 32 above]. 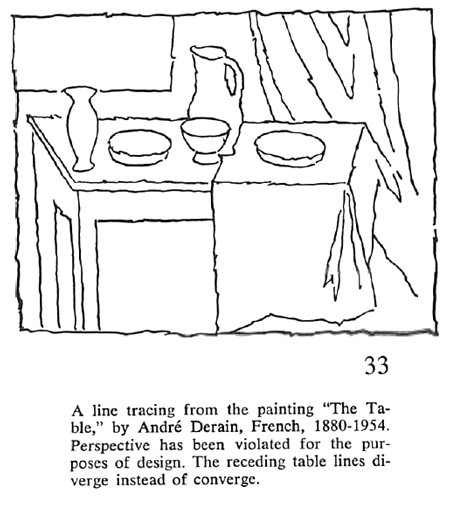 As to Figure 33 above, the artist’s violation of perspective fact indicates his preoccupation with design rather than representation. Let us start our perspective study with apples: three apples of equal size. In Figure 34 they are drawn as though on the floor at your feet, so that you are looking directly down at them. Seen thus, there is complete absence of perspective. 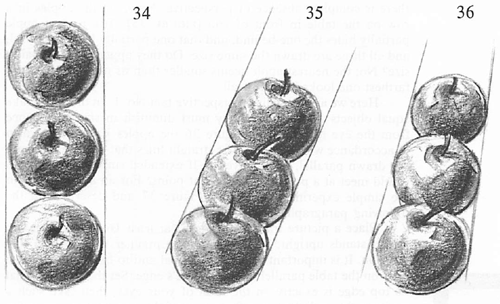 Now, set the apples in a row on the table in front of you [Figure 35]. The nearest apple partially hides the one behind, and that one partially hides the third; and all three are drawn the same size. Do they appear to be equal in size? No; the nearest apple seems smaller than its neighbor, and the farthest one looks largest of all. Here we are up against perspective fact No. I . In order to make equal objects appear equal they must diminish in size as distance from the eye increases. In Figure 36 the apples have been drawn in accordance with this law. The straight lines that enclose them are not drawn parallel, they converge. If extended sufficiently the lines would meet at a point. Where is that point? For an answer refer to the simple experiment shown in Figure 37 and described in the following paragraph. Place a picture frame with glass ( at least 16 x 20 inches) so that it stands upright. Secure it in some manner to hold it in that position. It is important to have it vertical and to have the edge that rests on the table parallel with the table’s edge. Set the frame so that its top edge is exactly on the level of your eyes; then take such a position that a light beam from your right eye (if you are going to squint the left one) will be just opposite the center point of the frame’s top edge. 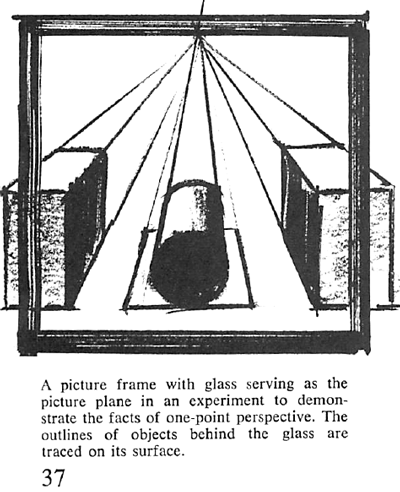 The glass represents what is termed the picture plane through which we look, in imagination, when viewing objects that we wish to draw. When we start to draw, the paper itself really becomes the picture plane inasmuch as the lines of our drawing follow the direction of those which might be seen through and drawn upon the glass. Place a piece of paper, say about 6 x 9 inches, in the center of the field (the area to be included in the drawing) behind the frame as shown in the sketch [Figure 37]. On it place a cylindrical can. With a china marking pencil, a lithographic pencil, or any grease point that will write on glass, trace the lines of the object seen through it. The position of the eye must remain fixed during this process. When, after tracing, the lines are extended upward on the glass, they will be seen to converge and meet at a vanishing point directly opposite the eye—the center point of the frame’s top edge. If the cylinder is assumed to envelop three apples, the question asked in the discussion of Figure 36 is answered. 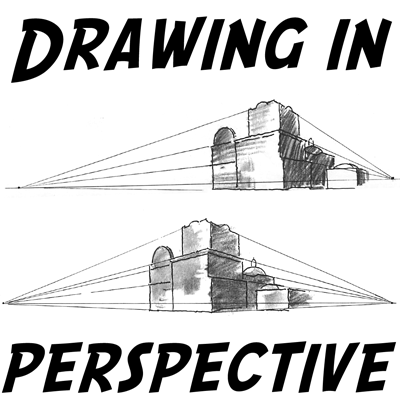 This exercise demonstrates what is known as parallel or one-point perspective. It applies to all conditions wherein receding lines are actually parallel to the direction of sight. Very good webiste. This is very helpful for all seo. Thanks!